This is a sponsored post on behalf of Bootler. All opinions are my own. Bootler is an online aggregation service for delivery food, or a search engine for delivery food. Basically, they work with over 6 different delivery services allowing users to pick a restaurant and compare prices, availability and delivery time saving their users time and money. They are not the delivery company. They only bring together other delivery companies and then redirect you to their website. Basically, Kayak.com for flights… you book the flight through Kayak, but you fly with American Airlines." Find Food Fast using Bootler--Compare Chicago's food and alcohol delivery all in one place. At the moment this company only operates out of Chicago--but a little bird told me they will be coming to NY hopefully soon. 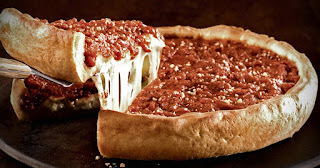 The pic below is of a Chicago Pizza-I prefer NY Pizza! Hey I'm a New Yorker born and bred!! And I really hope they make it to Westchester County, NY. I would certainly use them if they did!! Now this would be great for me but even better for my Mom who lives alone. She still cooks for herself--but from what she tells me--she really doesn't want to. But a meal delivered to her door--what a blessing that would be. I would no longer have to worry if she was eating or not. Search for whatever you are in the mood to eat. Then, Pick the restaurant you want delivery from. Here is an example of what you will see when you go to choose a menu. Doc B's Delivery. Did I mention they offer many different cuisines: American, Sandwich, Chinese, Mexican and Pizza. Build your custom order from the restaurant menu. If you are over 21 and live in Chicago, get alcohol from Saucey! Compare the different delivery companies' prices. Then, Select the delivery company to order with. Launching a mobile app in September"
It's great to have the option of the different cuisines all in one place without have to search everywhere. What a great service! I wish we had something like this in Canada! I so hope this service comes out this way. I'd love to have delicious foods delivered! I'm a New York pizza lover myself. I go home to NYC just eat and always get pizza in the Bronx. The Bootler service sounds neat and will be a great resource as they expand to more areas. This is amazing! I hope it expands to Orlando soon because we would definitely take advantage of the service. I had never heard of it before, but I'm surprised no one had thought of it ages ago. This sounds great, I love that it compares all the different options so you don't have to search around! I hope it comes to Toronto! This sounds like a neat delivery service. Sadly, we don't have this service here. Thanks for sharing. Bootler really seems to be on to something great except us small town people never get anything. It sounds wonderful and we would save a bit also. We could order from more than pizza shops and Chinese. I'll have to tell my big city friends to watch out for this in 2017. How cool, we never order delivery because we have very slim options in my area but I think this could be a winner when not cooking at home. Thanks for sharing. Other than pizza, there isn't a whole lot of delivery options here. I love the idea of Bootler,and having a service take care of dinner for me. This is really cool! I love this idea. Unfortunately we don't have delivery options here. It's not something that is common in Norway. This is PERFECT for an indecisive person like me! Unfortunately, I don't see this happening in my small town any time soon! I can't wait to live in a big city again! This sounds like an awesome service - much like a service I've used in Toronto! It's really amazing to have all of these options available at your fingertips. You would never have to leave the house of you didn't want to. What a great idea ! I had never even heard of before reading your post. I would love to try this service very soon.